After decades of raising children and preparing them for the realities of the world, most middle-aged women are jubilant when their young adults are without a criminal record, gainfully employed, and off of the family nickel or teat. For us, the empty nest is a positive experience because our children are doing fine on their own. Of course, we’d like to assume that the successes of our children are due to our superior parenting skills, but we’re also wise enough to know that a tremendous amount of luck, blessings, and other nurturing adults were involved to help Junior and Sis become productive adults. And we’ve shared countless tears with good mothers struggling with their children’s drug addictions, chronic unemployment, physical and mental limitations, or abusive partners. We’re also keenly aware that the dismal job market makes it difficult for our eager offspring to find good employment. That’s why it’s so exhilarating to celebrate when our young adult sons and daughters become self-sufficient. The rites of passage continue to evolve, and I try to anticipate the next opportunity that will tug at my heart, or bewilder my brain, or make me run away to live in a mountain cave. Midlife brings those complex days when I rock a grandchild to sleep, exercise with my grown daughter, share a beer with my son-in-law, listen as my son describes his tough job, take a sad friend to lunch, feel my daughter-in-law’s pregnant belly (but not in a creepy way), send a steamy text to my sweetheart, write a sassy short story, and then go help my ailing mother at the assisted living facility. Really, I can’t imagine life any other way. It took an empty dinner plate to make me comprehend the emotional consequences of my empty nest. 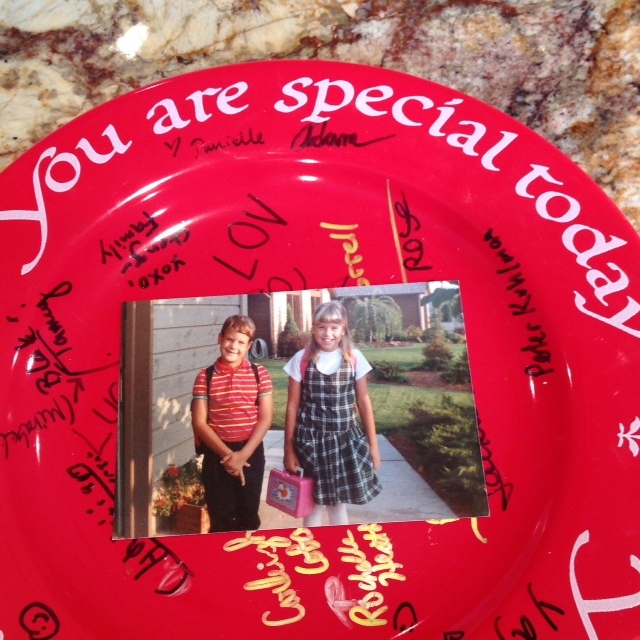 I held the bright red “You Are Special Today” plate, and tears rolled down my cheeks as I realized that my children had actually followed my advice to test their wings and that there was no one at home to need the plate. For over twenty years, the red plate was used to celebrate my children’s birthdays. Each birthday breakfast, they were served custom pancakes on the special plate. I made their initials in the pan and transferred the cakes to the plate, even when they were in high school. (Making an A was definitely easier than making an E.) On the evening of their birthday, dinner was a celebration as they enjoyed their favorite meal on the unique platter. During my daughter’s volatile vegetarian years, the plate was heaped with cheese lasagna and buttered corn, unless she gave herself special dispensation to have pepperoni pizza or a burger. When my son played high school football, the plate disappeared under a sizzling porterhouse steak. As they cleaned up every bite, they were rewarded with the familiar words telling them that they were, indeed, special that day. Then the plate was stored on the shelf until the next birthday. Suddenly the plate of platitudes wasn’t needed anymore. My daughter had moved to Maui after college graduation and was working three jobs in order to cover her expenses. My son had joined the army and was serving as a military policeman in South Korea. My kids not only left the nest, they left the mainland! I was lucky to see them once or twice a year. I admonished myself for inspiring them to be so independent. While my friends lamented that their twenty-something children had moved back home or, worse yet, had never left, I sulked with sadness at their great fortune. My children were several time zones away. What did I do wrong? The first Christmas without them was a total disaster, and I forced myself to decorate the tree and hang their favorite ornaments. During our holiday telephone conversations, I tried to sound cheerful and supportive, but after hanging up, I scurried about in a desperate search for chocolate or wine, or both, to sooth my loneliness. Ultimately, I was a mess. After doing some research on the empty nest syndrome, I was relieved to find I wasn’t alone in my sadness. Many people experience feelings of depression or grief after their children come of age and move out or go away to college. Women usually have a more difficult time than men, mainly because they have spent more time with their children. The women also could be going through menopause, which has its own set of emotional issues that are exacerbated by an empty nest. The problems are compounded when women experience physical problems associated with getting older or if they’re caring for aging parents. To hell with being called the sandwich generation. We’re the sack lunch of leftover stale chips. Our energy is depleted and we need chocolate now if we’re ever going to survive this woeful reality. After I grew tired of feeling sorry for myself, I decided to turn my sadness into positive energy. I saved money and took a trip to Maui to spend time with my daughter. I had no desire to visit South Korea, so I sent goofy cards and humorous gifts to my son and waited eagerly for his monthly telephone calls. My son was in South Korea for two holiday seasons, and our family used the experience to concentrate less on the material craziness associated with the season and to focus more on the meaning of family and freedom. It was truly cathartic when I reached for the special red plate and used it myself for New Year’s Day dinner. It was the beginning of a new life for me. The Empty Nest offers a splendid opportunity for personal renewal. You have more time, the house is quiet, you can sleep naked, and you don’t have to hide your favorite ice cream behind the frozen ham hocks anymore. Do it now so the kids can’t move back and bring their pet spider collection, garage band, and/or online gambling addiction. Also, you could use your extra time to enhance your personal relationships, take a class, try yoga, volunteer, or start a creative project. You may want to focus on your physical, spiritual, and mental health; maybe talk to a professional about that stupid song from the sixties that keeps squawking in your head. Or (my favorite suggestion) become the drum major of your own parade; just don’t forget to tip the guy who cleans up after the horses. And, of course, any midlife parade is best enjoyed with a bold red wine and a chocolate brownie on the “You are Special Today” plate. Because, you are. Lovely post. Engaging AND inspiring. I haven’t got a Red Plate but I have got plane tickets — I’m visiting my happily-all-grown-up-and-thriving son in California soon. I love the sentiment, but I have to admit: am starving this morning and your description of all that food is getting to me! Wonderful post. My youngest graduated from college three years ago and my nest has been empty ever since. I’ve gotten used to it, but I still miss having them around. Boy, you got me on this one, Elaine. Although my son is a senior in college and commuting, he’s basically out of the house! I know it’s not the same at all. But the thought of celebrating holidays without our kids sends shivers down my spine. That’s why it’s so important for us to realize our passions and create a new life for ourselves. That’s what I’m working on, and I know you are too. We’re having our first “different” Christmas this year. Youngest is in The Netherlands, and oldest wants to include her boyfriend and his parents (who we all love), so we’re planning on renting a house in Carmel. It will be wonderful, but different…oh so different. I am ready for different, but I suspect I will feel a little melancholy when it shows up! The holidays are, without doubt, the hardest. I’ve thankfully only had one (of three) regularly missing from holiday festivities… so far! You are so right, though: Personal renewal is the name of the game in the empty nest. It can be rough going at times, but so rewarding! I haven’t really experienced too much emptiness. My daughter moved back home after one semester away at college and now she lives a few miles away with my three grandchildren. Someone is always stopping by. But I love it. What a beautiful post…. You had me at the toasts and had me hanging on every memory and emotion! I think that our children’s successes bring up a good point-be careful how you advise them and what you wish for them because you just might get it! Why are we still doing multiplication to leave a comment? I don’t like the stress! Haha – Good for you on the success of your children! Some of us will never be empty nester. If it’s not one thing, it’s another! I forgot to mention that we had that plate growing up in my household. I finally removed the annoying math! Now, there are fuzzy letters. I hope that’s better! Thanks for your comments.